It is surprising that it took more than 25 years for the Orson Scott Card novel “Ender’s Game” to make it’s way to the big screen. The much-loved work won both the Hugo and Nebula awards for best science-fiction novel, and it remains one of the most important books in its genre. Unfortunately, writer-director Gavin Hood’s film adaptation isn’t nearly so noteworthy. Hood (“X-Men Origins: Wolverine,” “Rendition”) is a competent director, and he does a reasonably good job telling the story. 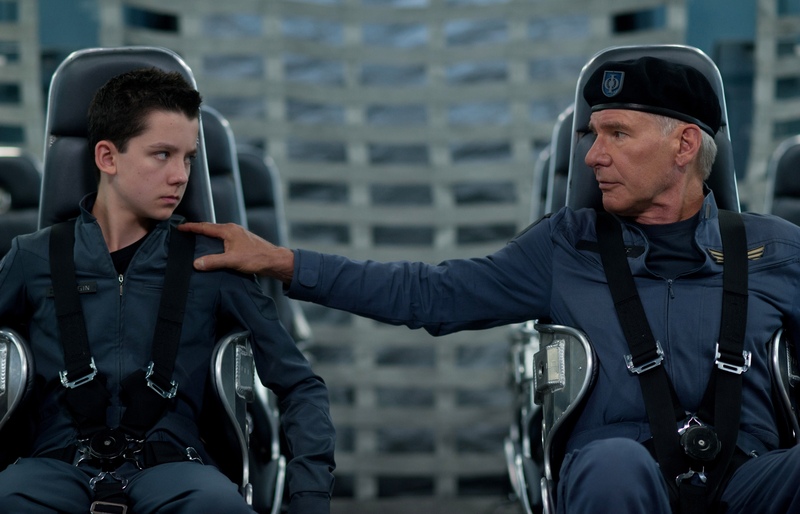 What his “Ender’s Game” lacks is emotion and closure. The film, like the book, is set in a future Earth where humans live in fear of a powerful, insect-like race that nearly invaded the planet 50 years before. In preparation for another invasion, Earth leaders train children in combat skills from an early age, preparing the best candidates for service in Earth’s military arm, the International Fleet (IF). One particular boy, Ender Wiggin (Asa Butterfield), is singled out for his particularly strong tactical skills. Convinced that Earth will face another invasion soon, Colonel Hyrum Graff (Harrison Ford) pushes Ender up the ranks of the IF, asking him to meet increasingly difficult tactical challenges. As expected, Ender performs well, although he frequently finds himself questioning his commitment to both the IF and its war games. Butterfield is believable as the young protagonist, and Ford is typically powerful as Graff, a military man whose convictions lead him to decisions that are morally and ethically questionable. The supporting cast is also good, with Ben Kingsley, Hailee Steinfeld, Abigail Breslin and Steve Jablonsky doing a nice job in secondary roles. The biggest trouble with “Ender’s Game” is that Hood rushes forward with his plotting but rarely pauses to allow viewers to think about its significance. This is particularly true in the movie’s final sequences, when Hood reveals a truth that should make filmgoers reevaluate everything they’ve seen in the movie’s first 100 minutes. Handled more skillfully, this would be the type of ending that would cement a movie’s reputation and launch countless philosophical discussions. Instead, Hood’s finale is terse, shallow and frustrating. This doesn’t make “Ender’s Game” a total loss, but it does make it a serious disappointment, especially considering the novel’s important place in science-fiction history. Blu-ray and DVD extras include several making-of featurettes, deleted scenes and two audio commentaries. Writer-director J.C. Chandor follows his well-received, 2011 drama “Margin Call” with an unusual cinematic feat: a one-actor picture with virtually no dialog. The movie, “All Is Lost,” centers on an unnamed protagonist who becomes stranded at sea, and Chandor’s only actor is cinema icon Robert Redford. In the film, Redford’s character awakens to find his small sailboat lodged on a metal cargo container that was drifting at sea. The collision tore a hole in the side of his craft, which is rapidly taking water. Because there is only one character in the film, there is nobody for Redford to talk with, so viewers watch as he silently dislodges his boat from the container and attempts to find safety. His situation is further complicated by damaged communications equipment and an incoming storm. “All Is Lost” moves forward with almost no verbal explanation, yet the story points are clear, and that is a tribute to Redford and Chandor. Alas, the story often lags. While the movie does a fine job depicting the horror of becoming lost at sea, it also bogs in sequences devoted to mundane survival tasks. Redford repairs his leaky craft, pumps water from its cabin and cultivates drinking water. Chandor needed to show these things in order to answer viewer questions, but they do not propel the action. In fact, addressing some of these acts in voiceover might have substantially improved both the pacing and intensity of the 106-minute movie. Redford’s portrayal of the protagonist doesn’t help either. Although his acting is wonderful, his hero is a stolid man who only shows emotion when things grow particularly dire. This is believable, but such a cool-headed approach to even life-threatening situations makes it easy for viewers to keep the character at a distance. Blu-ray and DVD extras include several making-of featurettes, storyboards, time-lapse footage and an audio commentary with Chandor and producers Neal Dodson and Anna Gerb. Writer-director Malcolm D. Lee waited 15 years to craft a sequel to his 1999 hit, “The Best Man,” and fans should be pleased with his work. “Best Man Holiday” delivers all the key characters from the original film, but much has changed since viewers last saw them. For one thing, central protagonist Harper Stewart (Taye Diggs) has watched his career come full circle. The book he was rolling out in the original film became a hit, propelling him to fame and a high-profile university job. But Harper’s follow-up effort was considerably less successful and the university laid him off. What’s more, Harper’s agent says his latest novel is unsellable. The timing couldn’t be worse because Harper and his wife, Robyn (Sanaa Lathan), are expecting their first child. Things are also tense between Harper and his one-time best friend Lance Sullivan (Morris Chestnut). “Best Man Holiday” explains that things never went back to normal after Harper’s book revealed that he once slept with Lance’s girlfriend (and now wife), Mia (Monica Calhoun). Despite the friction, Harper and Robyn accept Mia’s invitation to visit during the holidays. This sparks a reunion with many of Harper’s and Lance’s old friends, including Julian Murch (Harold Perrineau), Quentin Spivey (Terrence Howard) and Jordan Armstrong (Nia Long). As the group gathers, it works through old issues, faces new ones and attempts to rebuild the bonds that used to hold it fast. Lee’s screenplay is solid, if predictable, and it feels good to revisit these characters. The performances are solid throughout, with Diggs and Chestnut turning in particularly good outings. Although Lee telegraphs the film’s most important plot turn, the consistently powerful acting and well-built characters should allow most viewers to look beyond this. “Best Man Holiday” is also special in that it has the budget and cast of a traditional multiplex feature, but it can arguably be billed a Christian film. Too often, religious movies are made on shoestring budgets with inadequate talent. Lee allows his film to wear its Christian themes on its sleeve, yet the presentation is polished and sound. Obviously, one’s feelings about the material may be shaded by one’s personal religious convictions. That’s OK. The important thing is that Lee’s movie was designed with a particular point of view, and he delivers it nicely. Blu-ray and DVD extras include a making-of feature, a gag reel and an audio commentary by Lee. Director Ridley Scott has made some of the most important movies in cinema history, but his work has always been inconsistent. His finest features (“Blade Runner,” “Black Hawk Down,” “Gladiator”) are among the best in their genres. His worst (“Kingdom of Heaven,” “A Good Year”) are just plain dull. There is, however, no disputing Scott’s technical prowess, meaning even his artistic failures are appealing to the eye. Such is the case with “The Counselor,” a beautifully shot but unfulfilling picture about a lawyer (Michael Fassbender) who is drawn into the dangerous world of drug trafficking. Despite numerous warnings about the brutality of the business, this lawyer (referred to only as “counselor”) can’t refuse the prospect of quick money. So, he enters into a sketchy deal with veteran drug smugglers named Reiner (Javier Bardem) and Westray (Brad Pitt). Unsurprisingly, things go south, leaving all three men in danger. Even more distressing to the counselor is the fact that he has unwittingly imperiled his beautiful fiancé, Laura (Penélope Cruz). Scott reduces the movie’s dramatic tension by foreshadowing all of the struggles his characters will face. He also convolutes things by peppering the project with graphic sexual situations and discussions that have little to do with the plot. The result is a movie that bounces from place to place aimlessly, never gaining the traction it so desperately needs. This is a disappointment considering the quality of the cast. Fassbender is a great actor, and he seems committed to his role. Bardem, Cruz and Pitt are similarly strong, as is fellow star Cameron Diaz. Unfortunately, this group committed itself to a film without vision, and movies like that are hard to watch, no matter who’s in them. The DVD-only release has no extra features but the Blu-ray has an unrated, extended cut of the film. “Wadjda”: Foreign drama about a 10-year-old Saudi Arabian girl who hatches a plan to buy a bicycle even though her mother has forbidden it because of cultural concerns. Although the movie did not make the short list for the Academy Awards foreign film competition, numerous critics groups and film festivals honored it. Written and directed by Haifaa Al-Mansour. Presented in Arabic with English subtitles. “The Armstrong Lie”: Documentary film about cyclist Lance Armstrong and his legacy. The movie, of course, focuses heavily on his doping scandal, including the stripping of his Tour de France titles. Written and directed by Alex Gibney. “Diana”: Biopic focused on the last years of Princess Diana’s life, most notably her relationship with Pakistani doctor Hasnat Khan. Naomi Watts stars as Diana and Naveen Andrews plays Khan. Directed by Oliver Hirschbiegel. “Mike Tyson – Undisputed Truth”: HBO taping of former heavyweight boxing champion Mike Tyson’s one-man Broadway show. Directed by Spike Lee, the film features Tyson talking intimately about his life and career. “The Jungle Book”: Blu-ray debut of Disney’s 1967, animated film about a boy who was raised by jungle animals. The movie features the now-classic song “The Bare Necessities.” Directed by Wolfgang Reitherman.